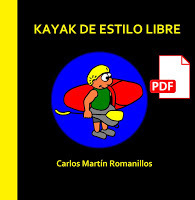 Welcome to the blog of the technical handbook "FREESTYLE KAYAKING", a book about rodeo kayak that includes all the current maneuvers of the freestyle kayak. No matter if you use your kayak in the wild waters of a river, in sea waves or in flat waters, in this book you will find instructions and practical exercises to complete from the simplest moves to the most elaborate combos. You can consult in the blog the content index, photos, animations made with the same color illustrations that appear in the book and even download for free the spanish edition of the book. So you can know the book before ordering it.